Val Stewart’s close planted vineyard at the top of Prices Rd (at Gladysdale), planted in 1988. 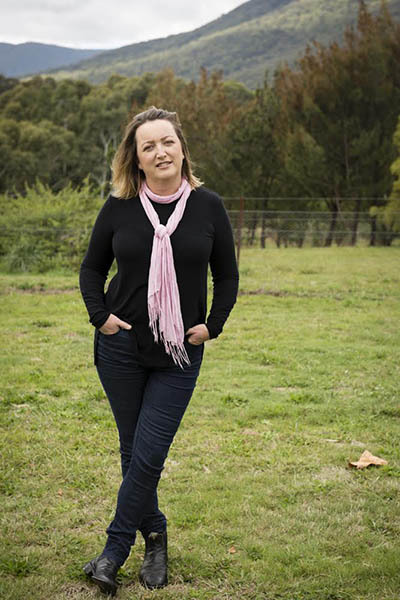 Nicky’s involvement in viticulture, post Roseworthy, saw her initially working at Henschke in the Barossa Valley, followed by Seppelt – both Great Western and Drumborg, and Coldstream Hills in the Yarra Valley. 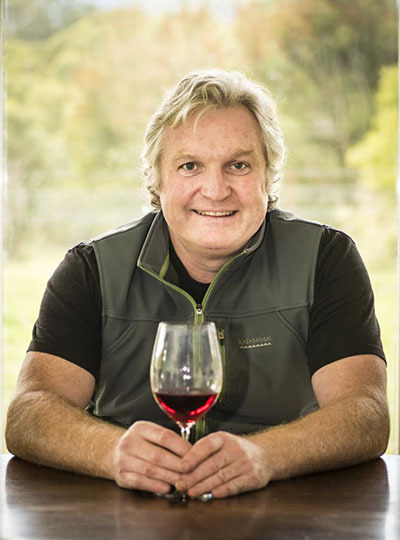 Dave is a veteran of 23 Yarra vintages (Oakridge, de Bortoli) and three French seasons taking in Burgundy, Alsace and Beaujolais for Louis Latour, Paul Blanck & Chateau Du Bluizard. The current (February 2018) release are the 2016 wines; these are all from Val Stewart’s vineyard at the top of the hill in Gladysdale. 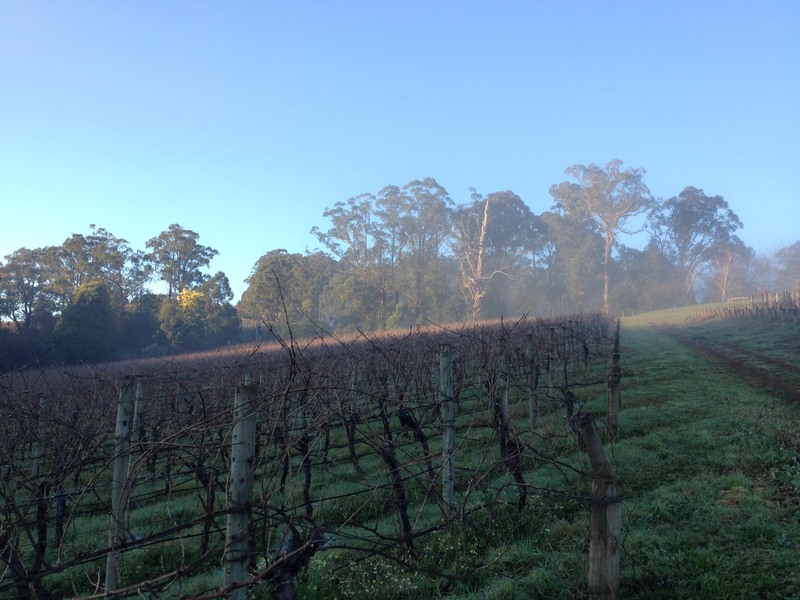 There is 1.0 Ha of chardonnay and 1.5 Ha of pinot noir. 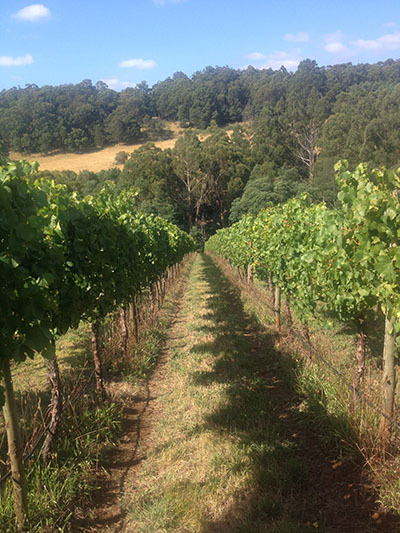 It was planted in 1988 with 3,660 plants/Ha, and sits between 332-363m ASL, in red volcanic soil. No wines have been submitted for review yet. With better flowering conditions than the previous year and a netted vineyard, we were able to pick near perfect fruit at 3.7 t/Ha. The seasons’ warmer conditions led to harvesting 12 days earlier than 2015 on February 27th. Analysis at harvest was 12.2° baume, 3.2 pH and 8.0 g/L of acid. Ideal numbers. After passively chilling the fruit overnight in a cool room, the wine was whole bunch pressed directly to 500 litre puncheons for fermentation. Fermentation occurred naturally and progressed to dryness over a three-week period. Once complete, the wine was sulphured on its fermentation lees, where it remained with monthly toppings until January 2017, when the vessels were blended into tank prior to bottling. Other than SO2, no additions were made to the wine. Harvest of the 2016 took place 8 days earlier, on March 4th under a fully netted vineyard. The crop level was 3.8 t/Ha with sugar at 13.3° baume, 3.4 pH and 7.2 g/L of acid. Fermentation commenced naturally after 4 days and progressed steadily through the next 14 days with just the odd pump over and some hand pigeage towards the end to liberate the last of the sugar. We then left the wine on skins for a further 4 days of maceration before pressing and transferring to barrels. We added one new barrel to the mix this year, therefore, just under 13% new, the rest all older than 4 years. The wine completed malolactic fermentation in late April, and was sulphured on lees, where it remained for 10 months until blending in late January. Other than SO2, no additions were made to the wine. 185 dozen were bottled in February 2017.